VOMATEX is the biggest stockholder of silicone ironing pads worldwide. For more information about the different available types, sizes and thicknesses please take a look at our Vau-Sik page. The most commonly used foams for ironing tables and presses are the silicone coated foams like our VOMAPOR silicone/foam. VOMAPOR is available in many different qualities, colours, thicknesses, etc. For a brief overview please see our VOMAPOR page showing the qualities always being in our big stock. If you require a different quality, colour or size we will be pleased to receive your inquiry. Since decades VERDEX Super-Latexfoam is used for ironing jackets and other garments with multiple layers and thick seams. The big advantages of VERDEX Super- Latexfoam are its high cubic weight giving a powerful pressure and the still unreached spot elasticity (softness) allowing thicker parts of the garment to completely sink into the padding which avoids shine and pressure marks on it. (e.g. REHAU foamed silicone and V-Max Aramid-needlefelt V 209). 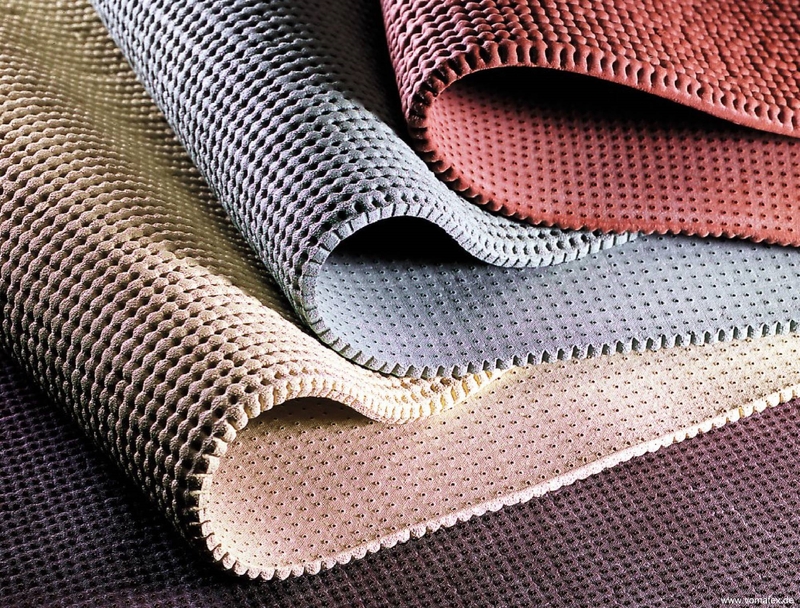 In order to gain better permeability we also offer VERDEX with a fine perforation. We also produce the Super-Latexfoam with a blue Nylon-Stretch backing. The article is called Voshn-Top and it is mainly used on small machines where the Latexfoam gets bend and stretched. 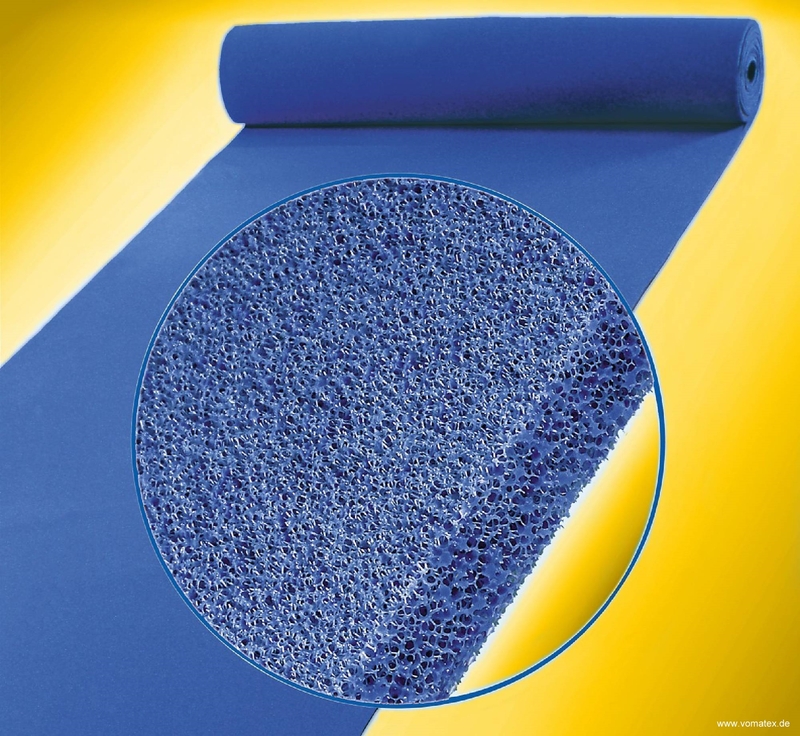 Sometimes VOMAPOR is mixed up with the blue Poly-foam which is the standard padding for industrial vacuum ironing tables offering a high cubic weight of 80 kg/cbm at a superior permeability due to the additional reticulation process which opens about 98% of its pores. The Poly-foam is not as heat resistant as VOMAPOR because of its missing silicone coating but it is an excellent padding if you avoid direct contact with hot metal surfaces. which you can also find in the ‘Cushion foams’ section of our website. If you still can not find your desired quality please send us a small sample and we will contact you by return. small fusing presses you require impermeable silicone pads with a smooth surface. You will find those in the ‘Silicone Pads’ area.